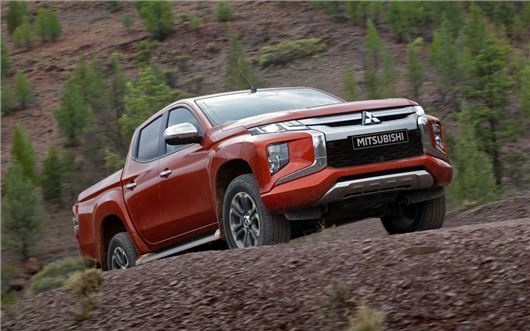 The Mitsubishi L200 pick-up has been given a bold new look and improved safety tech for 2019. The fifth-generation L200 was launched in 2015, but Mitsubishi has brought the mid-life update forward to celebrate the model's 40th anniversary. The one-tonne pick-up gets revised styling, with a new headlight and front grille design that aligns the L200 with Mitsubishi's SUV range. There are some minor changes in the cabin, with plastic frame surroundings for the infotainment, air vents and gearbox. Mitsubishi is also promising more soft-touch materials and better comfort, thanks to new seats and armrests. The current L200 uses a turbocharged 2.4-litre diesel engine, but Mitsubishi hasn't released any details about the powertrain for the updated model. The load bay is expected to be unchanged, which means the L200 will carry payloads weighing up to 1045kg. It'll also tow 3.5 tonnes when hooked to a braked trailer. As before the L200 is available with Super-Select or Easy-Select four-wheel drive, but both system are now available with new drive modes that allow the L200 to be optimised for gravel, mud, sand or rocky surfaces. When engaged, the driving mode will control the engine power, gearing and braking to maximise traction in challenging conditions. A new package of computer driving aids will also be available, with blind spot warning lights in the door mirrors and a rear cross traffic system that'll warn the driver of approaching vehicles when reversing out of a parking bay or driveway. An ultrasonic 'misacceleration mitigation system' will be available too, which Mitsubishi claims will 'reduce accidents resulting from improper use of the accelerator when moving off or reversing in car parks and other confined spaces'. UK specs, engines and pricing for the new Mitsubishi L200 will be confirmed in the coming months, ahead of the L200's launch in mid-2019.